Multi-functional hand held GPS devices, suited for all kinds of outdoor activities such as hiking, biking, running, geocaching etc. as well as for navigation in vehicles and for fitness training. Equipped with large color display with multi-touch function, integrated base map, electronic 3D compass, barometrical altimeter, optional heart rate and cadence sensor, USB interface, slot for optional µSD memory card and auto-routing (requires a map which is available as an option). 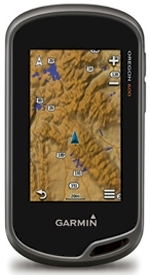 The models Oregon 600t and 650t come with a pre-installed topographic map of Europe, the models Oregon 650 and 650t are equipped with a built-in 8 Megapixel camera. All models support the U.S. GPS and the Russian GLONASS satellites. The models of the GARMIN Oregon 600 series are characterized by their low power consumption, their easy to use multi-lingual graphical interface with multi-touch screen ("two finger touch"), a very sensitive antenna plus a build-in base map. 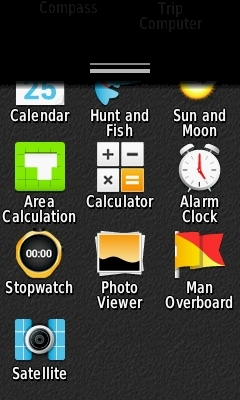 They adapt the display to the current orientation. Simply rotate the device to change from landscape to portrait mode and vice-a-versa. 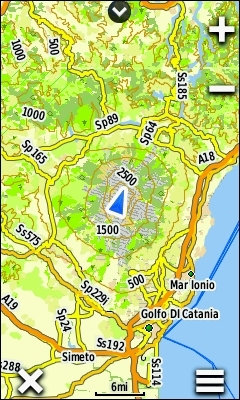 Depending on the model, they provide between 815 MB and 4.43 GB of free built-in memory to store optional maps with even more detailed information, such as local roads, restaurants and other points of interest. The models Oregon 600t and 650t come with a pre-installed topographic map of Europe scale 1:100'000, which occupies approx. 2.8 GB of the built-in memory. All models have a slot for a standard µSD memory card, a barometrical altimeter and an electronic 3D compass (3D = tilt-compensated compass which means the device doesn't have to be held level for accurate reading of the heading). The built-in USB interface supports data exchange with a PC and the Oregon 600 series supports also wireless data exchange with other GPS units which provide wireless communication capabilities. 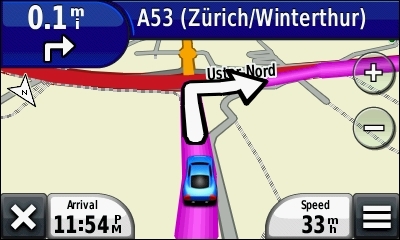 The auto-routing feature, which computes a route from the current location to any destination, requires an optional map which supports routing, such as City Navigator Europe NT or Topo Swiss, see MapSource for a list of all available maps. The models Oregon 650 and 650t are equipped with an 8 Megapixel camera with auto focus and digital zoom. The devices of the Oregon 600 series can not only receive the signals of the U.S. GPS satellites, but also of the Russian GLONASS satellites. This provides improved accuracy of the position indication, particularly under difficult conditions such as in cities with tall buildings, in narrow valleys, near steep cliffs and in dens forests. This is especially helpful when searching for geocaches. ¹) 2D means, you must hold the device level for reliable readings. 3D stands for a tilt-compensated compass which does not require the device to be level for accurate readings. 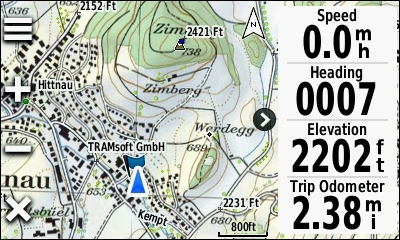 ¹) The pre-installed topographic map of Europe occupies about 2.8 GB of the built-in memory. Portable, easy to use, robust, waterproof to IPX-7 standards (withstands 30 minutes under water up to 1 meter (3 feet) deep). Large TFT color display with background illumination (65536 colors, 240x400 pixel). Supports portrait and landscape mode. Easy to use thanks to its touchscreen with multi-touch function plus its user friendly, graphical interface. Multilingual user interface in Croatian, Czech, Danish, Dutch, English, Finnish, French, German, Greek, Hungarian, Italian, Lithuanian, Norwegian, Polish, Portuguese, Russian, Spanish, Slovak, Slovenian, Swedish and Turkish. Integrated GPS receiver with very sensitive built-in antenna, processes the signals of the U.S. GPS satellites as well as those of the Russian GLONASS satellites. Integrated world wide base map with countries, bodies of water, major cities and major highways. Oregon 600t and 650t: Pre-loaded topographical map of Europe scale 1:100'000. 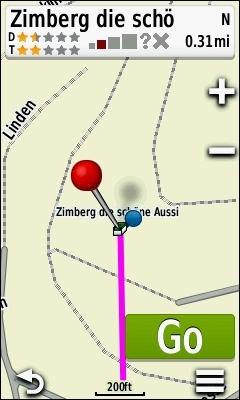 Built-in memory to transfer even more detailed maps with local roads, points of interest etc. 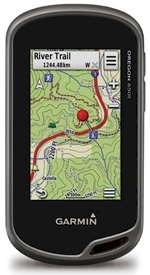 from a PC to the GPS (the pre-installed topographic map of Europe occupies approx. 2.8 GB of the built-in memory of the 600t and 650t). 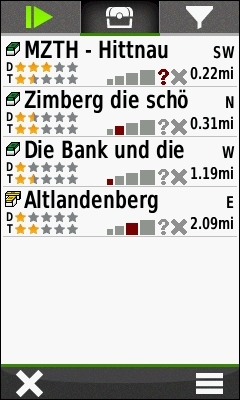 Routing speed: 14.52 (see GPS Routing Speed for details). 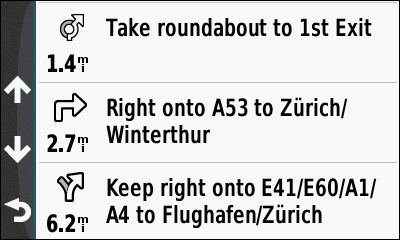 An optional map which supports routing is required, such as City Navigator Europe NT. Slot for standard µSD memory card. Memory cards are available as an option. 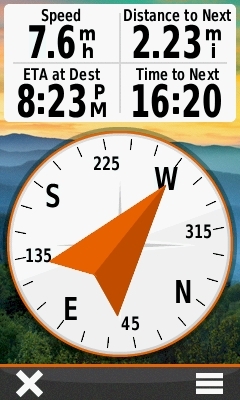 Electronic 3D compass to check heading while not moving¹. "3D" means unit doesn't have to be hold level for accurate measurement. Can be turned off to safe power, accuracy ±2°, resolution ±1°. Oregon 650 and 650t: Built-in camera with 2, 5 and 8 megapixel resolution, autofocus and flash light. Takes pictures in portrait and landscape format, 4x digital zoom. 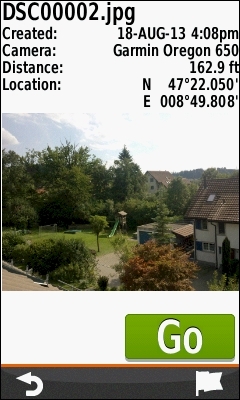 Automatically records the location where the picture was taken (geotag). Application to use the flash light as lamp with morse capabilities. Heart rate monitor, requires optional chest belt with heart rate sensor. The chest belt uses a digitally coded signal, which means, once a heart beat sensor and the GPS have been paired, the GPS will never receive a conflicting signal from another sensor. So you can exercise in close proximity to other sensors without fear of interference. Cadence monitor, requires optional speed and cadence sensor. Measures the number of revolutions of the crank arms with a magnet and a wireless sensor. Like the heart rate monitor, this sensor uses a digitally coded signal. 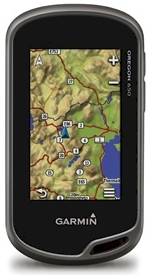 Once paired with the Oregon 600, the GPS will never receive a conflicting signal from another sensor. So you can exercise in close proximity to other sensors without fear of interference. ¹) In order to check the direction with a GPS, a minimal movement with a speed of at least 5..8 km/h (3..5 mi/h) is required. Where no movement is possible, a compass is needed. 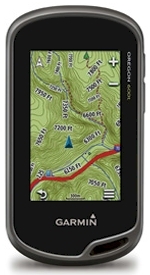 ²) Even though a GPS provides accurate elevation information, the value slightly varies continuously. A barometrical altimeter is therefore more accurate, especially when summarizing elevation changes. ³) TTFF: Time To First Fix, time until the first information about the current position is acquired. 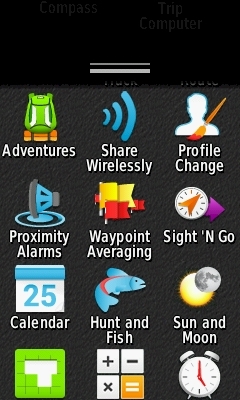 5 preset profiles (Recreational, Geocaching, Automotive, Marine, Fitness). Provides fast switching between different configuration settings of the device. 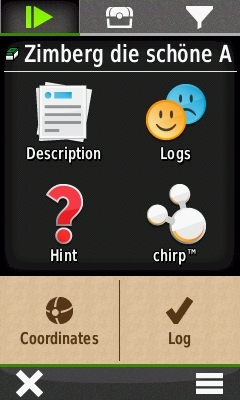 Supports also user defined profiles. 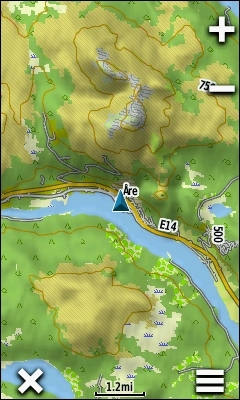 Stores 4000 waypoints with name (30 characters), icon (choice of more than 150 symbols), comments (50 characters), coordinates, elevation and depth. 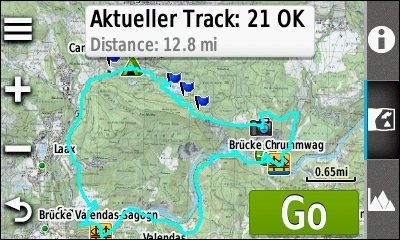 Support for ActiveRouting cartography - route calculation for various types of activities such as hiking or biking, requires an optional map which supports this feature, see www.garmin.com/de/topo/activerouting (in German). Support for LakeVu HD cartography - extrem detailed optional marine maps, see sites.garmin.com/lakevu. 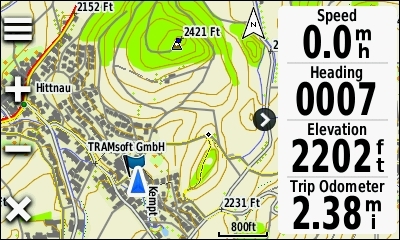 Find waypoints, cities, points of interest, addresses etc. 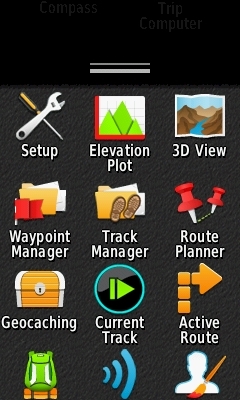 The objects you can actually search for depend on the maps loaded on the GPS. Various maps are available as an option, see list of MapSource products. Note: The Oregon 600/600t/650/650t adapts the display to the current orientation of the device: It may show every page either in landscape or portrait format. You may lock the orientation if you prefer. Many of the pages are configurable, the pictures shown are just examples. For the data fields, there is a choice of 95 different values, see selection. The two images below show the display of the Oregon 600/600t/650/650t in true resolution (240x400 pixels). This does not necessarily mean that the display is shown it its true size (38x63 mm). The actual size of these images depends on the properties of your display. Photo Gallery - these pictures were taken with an Oregon 650t and give an impression of the performance of the integrated camera of the Oregon 650/650t. This picture was taken with the optional map Topo Switzerland V3. 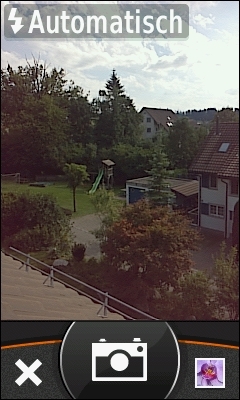 These pictures were taken with the optional map Topo Switzerland V3. 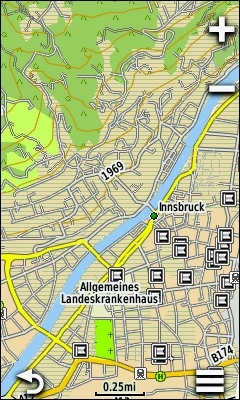 Note: This feature requires an optional map which supports routing, such as City Navigator Europe NT, see MapSource. Various examples of topographical map of Europe (Oregon 600t and 650t only). 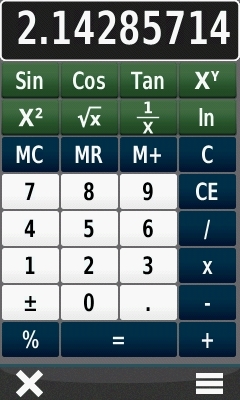 You can configure the device to show values in metric, english or nautical units. For each data field, you can choose one from the following 95 values. X 24hr Max Temperature Maximum ambient temperature during the last 24 hours (requires optional temperature sensor). X 24hr Min Temperature Minimum ambient temperature during the last 24 hours (requires optional temperature sensor). Accuracy of GPS Current accuracy of your GPS determined position. 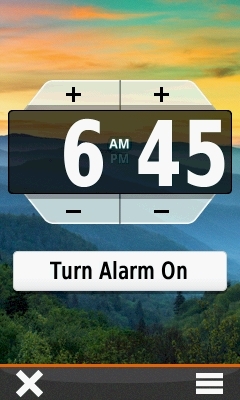 X Alarm Timer Current time of the countdown timer. Ambient Pressure Uncalibrated current pressure. Ascent - Average Average vertical speed ascending since last reset*). Ascent - Maximum Maximum ascent rate since last reset*). Ascent - Total Total distance ascended since last reset*). Automotive Turn Direction of and the distance to the next turn on a route. Average Cadence Average cadence (revolutions of the crank arm) of the current activity (requires optional bike speed and cadence sensor). Average Lap Average time for all completed laps for the current activity. Avg. Heart Rate Average heart rate of the current activity (requires optional heart rate monitor). Avg. Heart Rate Percent Average percentage of maximum heart rate for this activity (requires optional heart rate monitor). 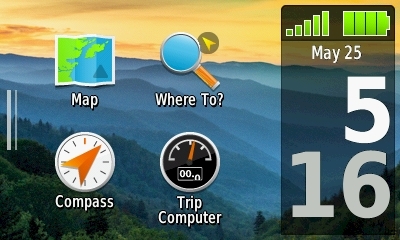 Battery Level Battery charge level. Bearing Direction from a position to a destination measured to the nearest degree; also called an azimuth. In a GPS receiver, bearing usually refers to the direction to a waypoint. Cadence Revolutions of the crank arm per minute (requires optional bike speed and cadence sensor). Calories Calories burned during this activity. Compass Heading Direction the device is pointing to based on the built in electronic compass. Course The direction from the beginning landmark of a course to its destination (measured in degrees, radians, or mils) or the direction from a route waypoint to the next waypoint in the route segment. Current Lap Elapsed time for the current lap. Depth Depth of water (requires NMEA input from a sonar device). Descent - Average The average vertical speed descending since last reset*). Descent - Maximum The maximum descent rate since last reset*). Descent - Total The total distance descended since last reset*). Distance to Destination Distance between the current position and the final destination of the current route. Distance to Next Distance between the current position and the next waypoint or turn in the current route. Elapsed (Total) Time Duration of the current activity including stopped time. Elevation Current altitude above sea level based on built-in barometer. 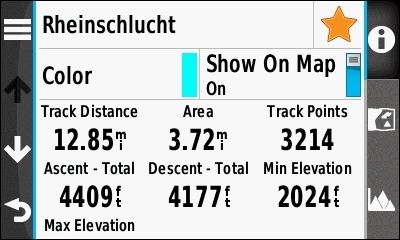 Elevation - Maximum Highest altitude above sea level since last reset. Elevation - Minimum Lowest altitude above sea level since last reset..
Elevation Above Ground Current elevation above ground. ETA at Destination Estimated arrival time at the final destination of the current route. ETA at Next Estimated arrival time at the next turn along the current route. Glide Ratio The ratio of horizontal distance travelled to vertical distance. Glide Ratio to Destination The glide ratio required to descend from your current position and elevation to the destination's elevation. 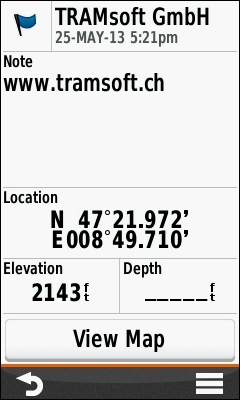 GPS Elevation Current altitude above sea level based on GPS. GPS Heading Direction in which you are currently moving based on GPS. 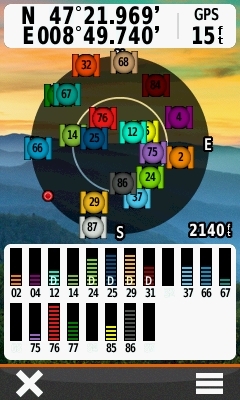 GPS Signal Strength Strength of satellites' signals. Grade Current grade computed from elevation change over distance. Heading Direction in which you are currently moving. Heart Rate Current heart rate (heart beats per minute, bpm, requires optional heart rate monitor). Heart Rate Percent Max Percentage of maximum heart rate (requires optional heart rate monitor). Heart Rate Zone Current heart rate zone (1..5). Default zones are based on the user profile, the maximum heart rate and the rest heart rate, but may be changed by the user (requires optional heart rate monitor). Lap Ascent Accumulated elevation gain during the current lap. Lap Cadence Average cadence (revolutions of the crank arm) for the current lap (requires optional bike speed and cadence sensor). Lap Descent Accumulated elevation loss during the current lap. Lap Distance Distance travelled during the current lap. Lap Heart Rate Average heart rate for the current lap (requires optional heart rate monitor). Lap Heart Rate Percent Percentage of maximum heart rate during the current lap (requires optional heart rate monitor). Lap Speed Average speed during the current lap. Laps Number of completed laps during the current activity. Last Lap Ascent Accumulated elevation gain during the last completed lap. Last Lap Cadence Average cadence (revolutions of the crank arm) for the last completed lap (requires optional bike speed and cadence sensor). Last Lap Descent Accumulated elevation loss during the last completed lap. Last Lap Distance Distance travelled during the last completed lap. Last Lap Heart Rate Average heart rate for the last completed lap (requires optional heart rate monitor). Last Lap Speed Average speed during the last completed lap. Last Lap Time Duration of the last completed lap. Location (lat/lon) Current location as latitude/longitude coordinates. 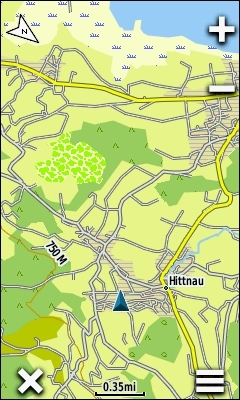 Location (selected) Current location indicated in the selected format (datum). Location of Destination Coordinates of the final destination of the current route. X None Blank data field. Odometer Total accumulated distance travelled since last reset*). Off Course The distance you are off the desired course. Pointer Arrow that indicates the direction to travel to the next point on a route. Speed - Maximum Maximum speed since last reset*). Speed - Moving Avg. 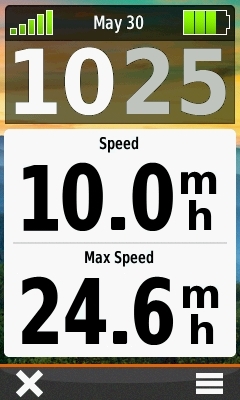 Average speed without the time with no motion since the last reset*). Speed - Overall Avg. 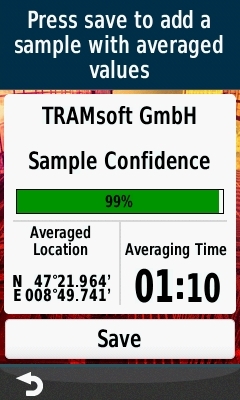 Average speed including the time with no motion since the last reset*). Speed Limit Current speed limit based on the information provided by the map (requires optional map with speed data). Stopwatch Timer Elapsed time for the current activity. Sunrise Time of sunrise at the current position. Sunset Time of sunset at the current position. Temperature Current ambient temperature (requires optional temperature sensor). Temperature - Water Temperature of the water (requires an external data acquisition device). 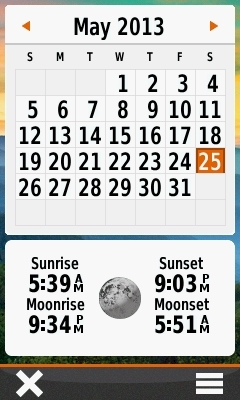 Time of Day Current time. Time to Destination Estimated travel time to the final destination of the current route. Time to Next Estimated travel time to the next waypoint (turn, crossing etc.) along the current route. To Course Direction to the planned course. 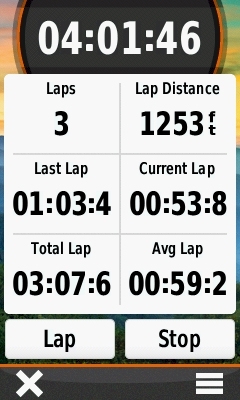 Total Lap Elapsed time for all completed laps. Track Distance Distance travelled for the current track. 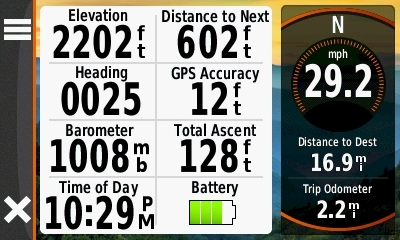 Trip Odometer Travelled distance since last reset*). 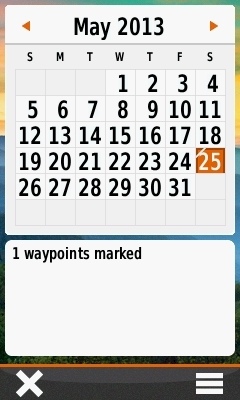 Trip Time Elapsed time since last reset*). Trip Time - Moving Accumulated time while moving since last reset*). Trip Time - Stopped Accumulated time while not moving since last reset*). Turn Difference between the bearing to your destination and your current course. Velocity Made Good The rate of closure to the destination, based upon your current speed and course. Vertical Distance to Destination Elevation difference between the current position and the final destination of the current route. 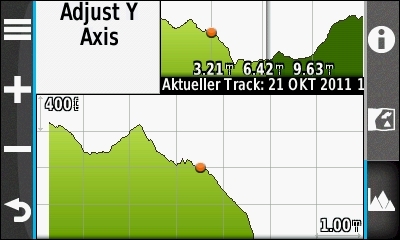 Vertical Distance to Next Elevation difference between the current position and the next waypoint in the current route. Vertical Speed Current ascending or descending speed. Vertical Speed to Destination Required rate of ascent or descent to reach the final destination. Waypoint at Destination Name of the waypoint at the final destination of the current route. Waypoint at Next Name of the next waypoint along the current route. 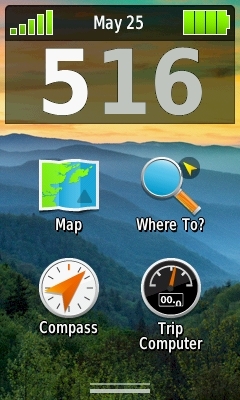 *) You may reset the trip-counters, the odometer and the maximum speed separately. These models have been discontinued; however, you can still order options for the Oregon 600 series. All options for the GARMIN Oregon 600/600t/650/650t in detail.